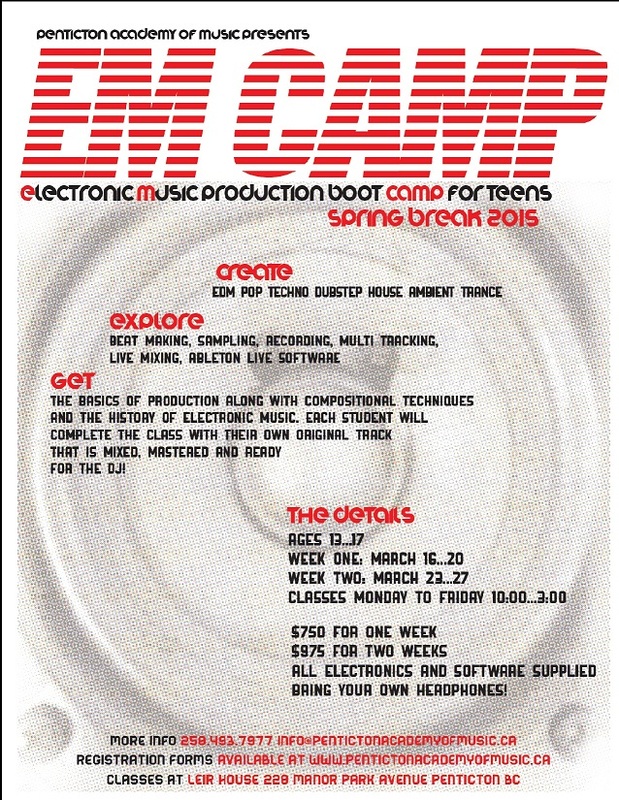 EMCAMP for teens is a new initiative presented by the Penticton Academy of Music in the Leir House that will take place during Spring Break 2015. Teens are invited to sign up and come explore the rich and diverse world of electronic music – edm, pop, techno, dubstep, trance, house, ambient. Students will learn the technical side of electronic music creation (including recording, editing, multi-tracking, beat sequencing, and mastering), explore the history of electronic dance music and receive hands on tutorials to create their own composition. No prior musical experience is needed. With lots of one on one time with the instructor, Andrew Wedman and his assistant, Allan Eggert, this course is suitable for all experience levels. A large focus of this course will be on experimenting with different compositional techniques and finding your own personal style. Equipment is provided but students are asked to bring their own set of headphones. Each student will finish the camp with their own original track that is mixed, mastered and ready for the DJ. Instructor Andrew Wedman formed the techno duo Tinkertoy with former punk / ska singer Paul Shrimpton in 2000. After releasing on their own record label Lautmaschine, Tinkertoy was signed to Noise Factory Records, released two albums and performed live electronic music in Toronto, Montreal, Ottawa, New York, Cologne, Berlin and Barcelona. Andrew now performs experimental music using pianos with alternate tunings most recently in Toronto and Berlin and works as a certified piano technician in the Okanagan. Andrew Wedman holds an ARCT in piano performance and he majored in music theory and studied electro acoustic composition for his undergrad at McGill University. EMCAMP runs Monday to Friday from 10am – 3pm March 16 – 20 and March 23-27. Sign up for one week or two. For more information and to download a registration form visit www.pentictonacademyofmusic.ca, visit the Academy of Music office in room 1 of the Leir House or call 250.493.7977. Space is limited so register early to avoid disappointment.